Early theme discoveries and superior situational awareness are clear competitive advantages. Yet, such early discoveries and awareness can only result from a real-time perception of an expansive market context – which are much more than an awareness of the competition. To achieve a realistic competitive context, Discovery Patterns teamed up with Industry Building Blocks [IBB]to create the most powerful real-time context engine for market intelligence. IBB was founded by Alan S. Michaels, who envisioned an alternative to NAICS to support corporate planning and competitive intelligence. 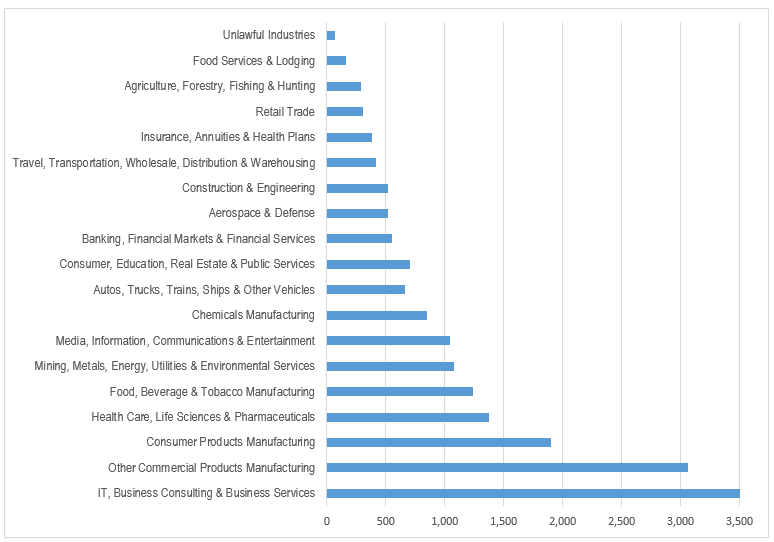 At this time the Industry Building Blocks Classification System(TM) contains over 19,200 unique industries, a value that is 15X more granular than classifications like NAICS and SIC codes. The modular nature of IBB classifications enables Discovery Patterns to start its analytic engines with competitively relevant industry combinations, competitive ecosystems, ETF’s, themes/motifs, partner groupings and ad hoc combinations. The combination of IBB classifications plus Discovery Patterns analytics produces Industry Graph. Industry Graph is an advanced form of business and financial discovery from unstructured data like news, blogs, texts, social media and multimedia. Like other forms of discovery, Industry Graph anticipates user interests, even if a user does not know how to define his/her personalized competitive environment. Industry Graph also provides our clients with a disciplined and ever updated definition of competitive interests like changing competitors, buyers, suppliers, market substitutes, and emerging competitors. Industry Graph is in sync with similar Internet information advancements like Google Now, Facebook’s Social Graph and Linkedin’s Economic Graph which also anticipate user interests – except in the case of Industry Graph, because we do not need prior client browsing behavior or social sharing data. Most searching and listening tools require clients to know on which topics they need to focus their tools. Not so with Discovery Patterns. We start with a general definition of a client’s business and financial interests, from which we apply the massive scope and discipline of Industry Graph to expand the detail of potential trend discoveries. Our clients apply their unique market perspective. We leverage that perspective with our Industry Graph detail and continuous trend discovery processes to discover the important and changing connections among numerous industry participants and influencers. The IBB classification System [TM] is unique not only because of its 19,200 industry granularity, but also because the industries were defined and analyzed by leveraging the five forces model – the competitive forces first advocated by Michael E. Porter of the Harvard Business School. By tracking and seeking interactions among relevant industry competitors, buyers, suppliers, entrants and substitutes, we discover early trends while they are generally hidden from public awareness.